Man, this couple really takes the whole “till death do us part” thing seriously. 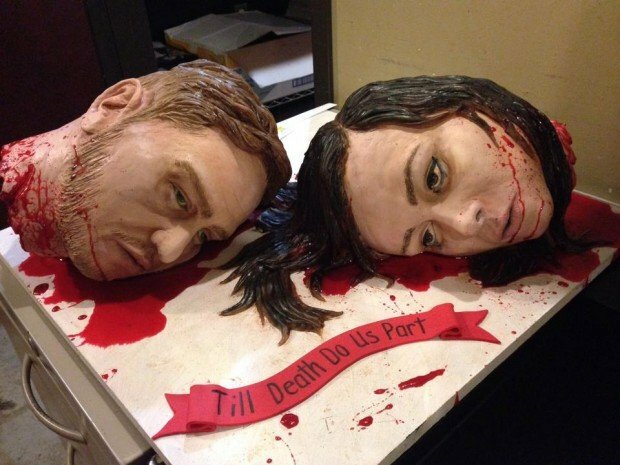 This great wedding cake has both the bride and the groom decapitated. Well, two heads are better than one, even on a cake. This is either very romantic or very disgusting depending on your perspective. Yes this was actually a wedding cake and the bride and groom held their wedding at one of Austin’s Alamo Drafthouse cinemas, which seems appropriate. I really thought that this was how Dexter was going to end, with a grand wedding and two decapitations. See what you missed out on Showtime? This could have been your haunting final scene. Oh well, in my mind that’s how it ended.